Some of my long-time readers may remember this post, in which I shared the recipe for Michael’s favourite dessert, fruit pizza. It’s a tradition for me to make it for him for his birthday. Sadly, since it contains both flour and dairy, it’s off Michael’s list of can-haves. I put my thinking cap on, revved up the creative engine, and rolled up my sleeves (enough metaphors yet?) to work on making it Michael-friendly; that would mean gluten-free and vegan*. The crust came out great on the first try, but I failed at my first attempt at the filling when I used coconut milk and agar-agar. Happily, I came up with a winner using cornstarch. Sometimes it takes a bit of experimentation and yes, even failure. But the end results are oh-so-sweet. **NOTE: Use good-quality coconut milk and don’t skimp on the fat. I recommend Thai Kitchen’s full-fat coconut milk,which is very sweet and luxuriously creamy. To make the crust, melt the margarine and coconut oil, then blend in sugar. Add flours, oats, pecans, and the mashed banana. Spread onto a pizza pan. I found that the oils made this batter difficult to spread using a wooden spoon, but using my hands to pat it in place worked very well. Bake at 375°F until the edges brown (around 10 minutes). Because of the banana, this crust is a bit cakier and takes longer to bake. After the edges browned, I used the broiler to crisp up and brown the top of the crust, which took just a few minutes. Watch carefully so that you don’t burn it! Remove from oven and allow to cool completely. The final crust was cookie-like and softened up to a nice chewy texture after being refrigerated with the topping on it. It did taste quite oat-y compared to the original, but I rather liked that. If you prefer less of an oat flavour, I think you could safely replace some or all of the oat flour with more rice flour. For the filling, shake the can of coconut milk to blend the fat and liquid. Pour it into a medium-sized pot and set the heat to medium. Dissolve the cornstarch in several tablespoons of cool water, then stir it into your coconut milk. Add the maple syrup and lemon juice. (You could also add vanilla, but I didn’t, as it doesn’t agree with Michael.) As the mixture heats up, be sure to stir continuously to avoid starch lumps. The cornstarch will start to work its magic, thickening up the coconut milk. When it reaches the consistency of pudding, remove from heat. Allow to cool before spreading it onto the crust. It will thicken up a little more when it has been refrigerated. After spreading the coconut milk onto the crust, decorate with your fruit toppings as desired. Cover the whole pizza with saran wrap and chill until set, at least several hours or overnight. It’s also a good idea to put a bigger pizza pan underneath, if you have one, to catch any drippings from the glaze. Can I have another birthday this year? Please? Grody??? Duh, isn’t that, gosh, why – like totally valspeak? This looks gorgeous — and completely delicious. I invented something like this once in college, using a sugar cookie kind of dough, fruit and apricot glaze. But the addition of the coconut milk pudding sounds heavenly. Can’t wait to try it! Now you’ve made me hungry! I can’t wait to try this recipe! It is perfect for summer. Good job with the modification! I do not know how you do it. Do you just really LIKE to cook, so these challenges do not throw you? Seriously, I SO hate to cook that when I look at all the different things you guys CAN”T eat, between Jade and Michael’s needs, I feel like I would just want to run away, screaming. Earth Balance margarine? Oat and rice flour? (I didn’t even know they MADE different kinds of flour. I just thought flour was, well, you know, FLOUR.) Coconut milk? How do you COOK with that stuff? And make things taste real, like you want them to? Ok, so I started out by saying, and my REAL point is, I so totally admire you, your willingness and ability to do this, and make it seem like it’s no big deal. But then, keep in mind, my specialty when it’s my turn to cook a meal is cereal and toast, so it isn’t any wonder what you do seems so overwhelming to me. You’re such a good mom, and wife! And cook, apparently!! 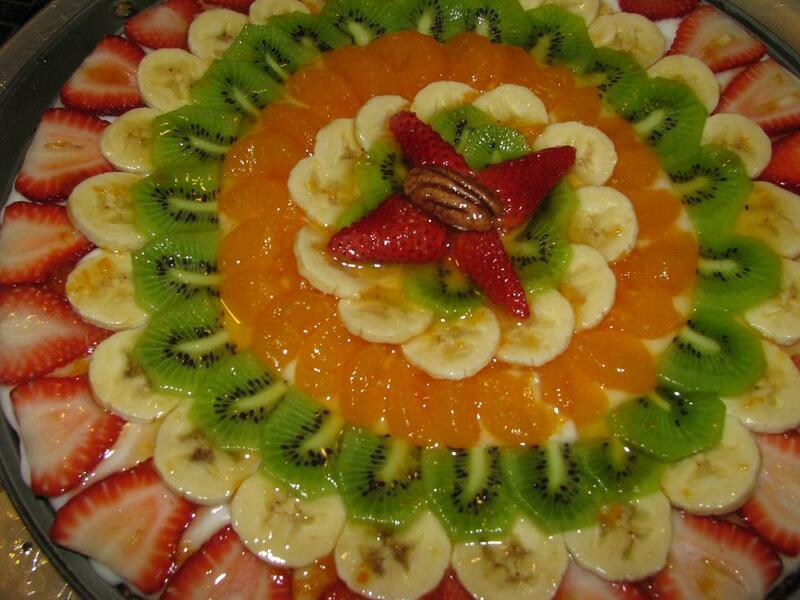 I have made fruit pizza before but mine never looks that professional. Beautiful job. I love to cook but I am with Laurie. If I was faced with the challenges you are in feeding your family, I would curl up in a ball and cry. Wow, didn’t see the pic in the email version of the post – probably had “load external content” deactivated. Oma then wrote a mail about the eye’s delight, so I had to come back for a second look. Whoever said “a pic is worth 1000 words” had it right. Nice work of art. If we accept the banana as being “white”, we even have a passable Italian flag here to match the “pizza” idea. Gluten Free Goddess has an oatmeal chocolate chip cookie to die for! Even Em can’t tell it’s gluten, dairy, soy, nut free!! I like her use of sorghum,millet and tapioca flours for the cookie base that means you can’t tell the difference from real. I don’t think I’ve seen the Aroy brand but I know I can get Thai Kitchen. Hmmm…what have I been using??? GFG also has a recipe for coconut milk ice cream! Now I need an ice cream maker!!! (Belated …) Happy B-Day to Micael – hope you guys had a wonderful day (besides enjoying that yummy fruit pizza 🙂 ) ?! Holy moly that looks divine! I am most definitely going to try it! Thanks for sharing the recipe and for the excellent notes. I keep forgetting to say that Becel has a vegan margarine now and it tastes good! Better than Earth Balance. Is good in baking too. For nut allergies what can you use as a substitute for ground pecans? I plan to make this to share at my son’s class for his Birthday and there is a nut allergy. If you do have time to experiment, you might check out Gluten-Free Goddess’s cookie recipe that Captain Momma recommends — it might make a decent crust base. Leaving out the chocolate chips, of course! I found the link for you: Gluten-Free Chocolate Chip Oatmeal Cookies. Hi Fawn, the Fruit Pizza was a success! Thank you for this recipe! I even had a mom ask for the recipe. Her child typically can’t eat any of the treats that are brought in to school, and I guess he was so thrilled he was able to eat birthday treats like all the other kids that day. I passed along your link to her for the recipe. I was so fearful that the kids would not like the idea of fruit pizza since many are so used to having sugar sweet treats for birthday celebrations at school, and that this fruit pizza would be different from the typical sugar cookie and cream cheese recipe. The teacher said they all loved it. I did use 2 Tbsp of unsweetened coconut in the crust, rather then extra flour and it seemed to work out just fine. I baked the crust on stoneware and watched it, so it did bake longer then 10 minutes, but turned out golden brown and beautiful. I used sweet rice flour, rather then rice flour. I know in my pancakes it makes the texture “less gritty”. I also agree on lessening the oat flour, I think next time I will lessen the oat flour a bit to see if the flavor is less “oaty”. For the filling, as my fears set in of everything not being sweet enough for these kids, I added light agave to sweeten the filling up a bit after it finished cooking; it added a soft sweetness, and was not overwhelming. Maple syrup typically is pretty sweet, but I was surprised how its sweetness lessened as it was cooked down. Anyway, your fruit pizza recipe is a success. Great work! Thank you for taking the time to experiment, perfect, and pass it along to all. Hurray!!! Thank you so much for letting me know how it went, and for sharing your variations, too. I’m so thrilled that others can benefit from my experiments! I just had another thought, which is to add some unsweetened fine coconut to the crust ingredients. That sounds yummy to me! PS- so far in my search for gluten free vegan fruit pizza, your fruit pizza reads divine! I can’t wait to make and taste! Thank you for this. Funny it is a year to date (almost) when you posted. I think it was meant to be; his b-day is the 13th. Thank you so much for advise on subs for nuts. I will experiment a bit tonight, and look for a box of mix in case I really mess up. Thank you so so much! I’m so glad, Nanno! Thanks for dropping in and letting me know!